First of all, create Private Key from Seed. have your Private Key ready. 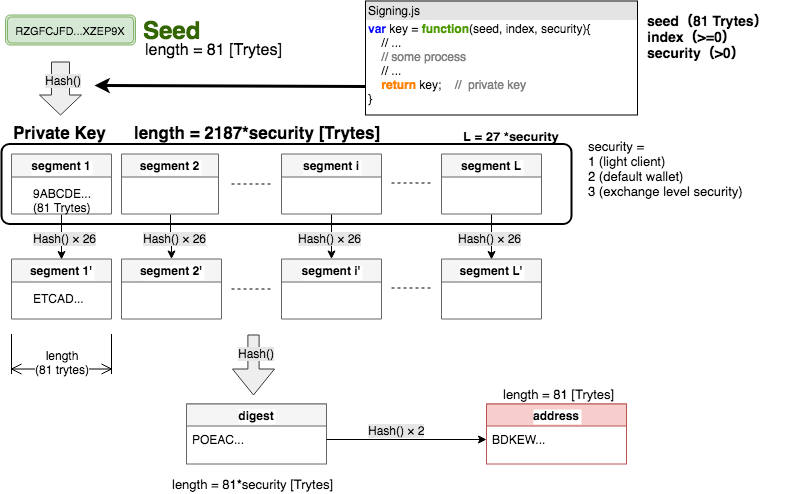 divides the Private Key into 'L' segments, where L = security * 27. Hash all segments as a whole. The product is called digest. Hash digest twice. The product is called address. Signature is used to sign anything(=signed data usually bundle) on tangle that belongs to you with your private key. For each i-th tryte of the Signed Data, get decimal 'd' of the tryte. Converter here. e.g) tryte corresponds to d=0, [A] is to d=1...[M] is to d=13, L is to d=-13...Y is to d=-2, Z is to d=-1). Those hashed segments are called Signature together. divides the Signature into 'L' segments, where L = security * 27. Hash those segment together and get digest. Check if the product of step 5 matches the address of the signed data(usually Bundle). 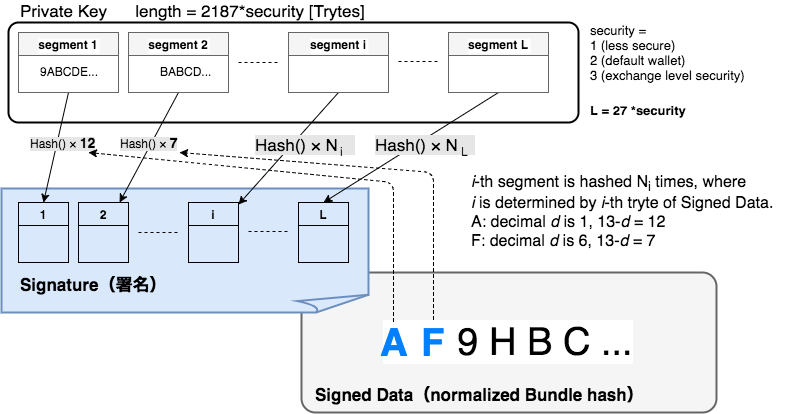 data, data, data, which are components of normailized bundle hash, are used as Signed Data. How many times to hash each of 27 segments coressponds to each tryte of 27 trytes signed data. data[i] above is 27 trytes of signed data. if security = 1, data is used. if security = 2, data and data is used such that in total, 54 trytes are used to sign. 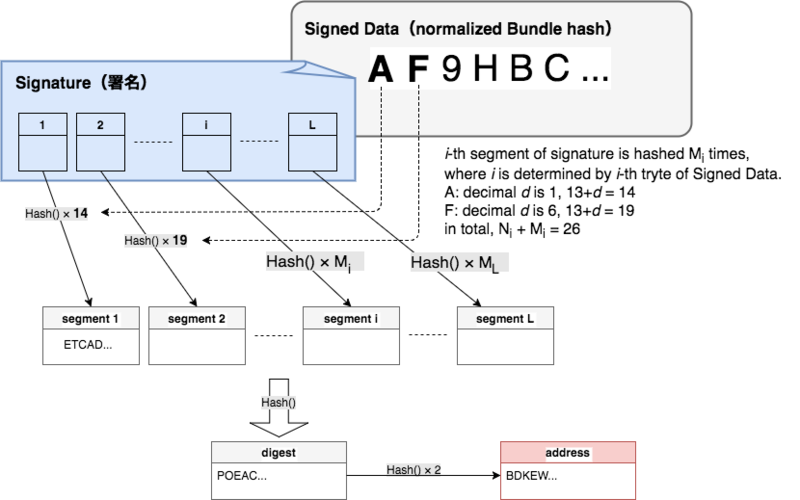 (table above) Recall the when creating bundle, numbers of transactions that store signature depends also on the security level. That was because as security level increases, more data[i] is used to sign. Even though API raises error, security >= 4 is allowed in protocol (i.e. transaction is confirmed), in this case, data does not exist so use data again and so on. * @return normalizedBundle A normalized bundle hash. //  normalized Bundle 81 trytes. //  divides bundle hash into three sections, 27 trytes each. //  check each tryte in a section. //  get corresponding integer [-13~13]. And add it to sum. Number of hashings depends on i-th tryte of signed data. If signed data contains a lot of 'M', which requires zero hashing. This may result in the exposure of the part of your raw private key. This kind of signing mechanism originates from Winternitz one-time signature.